I have a love/hate (but mostly love) relationship with Ikea. On the one hand, it's just so cheap and easy to buy Ikea furniture, but on the other hand you know it's probably not going to last more than 2 years because it's just glorified particle board. Still, there are some great items at Ikea that I think can blend equally well into a newly furnished home, or in a mature well-lived in home. It's especially a pleasant surprise when I see photos of spaces where Ikea pieces are mixed in so well with higher end pieces (check out my Pinterest to see some examples!). For that reason, no matter what my budget or how lived in my home will be, I will see myself as always keeping Ikea as an option for home decor. Curious to see my favorite Ikea pieces? Click through the jump! 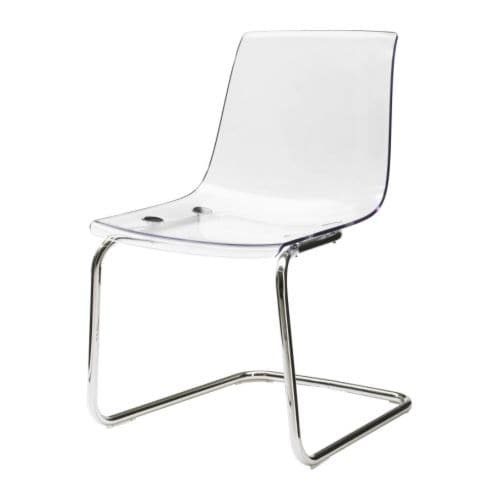 Tobias Chair - I consider this Ikea's version of the famous Ghost Chair by Phillip Starck. I can imagine buying the Tobias chair as the side chairs to my future dining room table while placing the ghost chair on the ends of the table. It's great as a dining chair, vanity chair, and perhaps an office chair if you drape a sheepskin or place a cushion on it. Overall, it's an affordable way to incorporate clear furniture into your home if you're into that look. 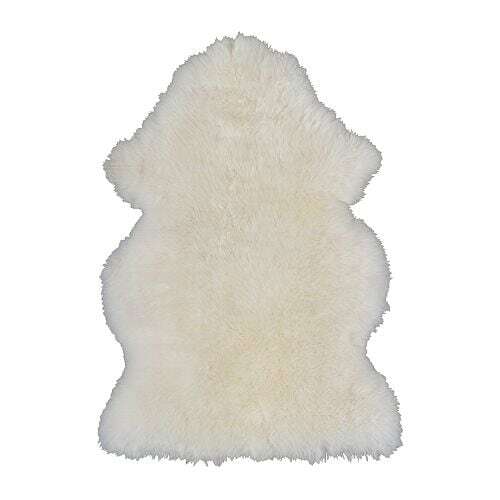 Rens Sheepskin - I love sheepskin as a home decor item. Placing it anywhere in a space adds instant glam and a luxurious feel to a space since the texture of the skin is so plush. Plus, you will not find a cheaper price than $30 for a real sheepskin anywhere. Since these hides came from real animals, each pelt is unique. I must've spend 5-10 minutes digging through the pile to find a pelt I liked. My advice is to take your time and find a piece that has the texture, fur thickness, and color you like. Don't underestimate the value of this decor item and what it can do to a space! Lappljung Rug - Most people usually go for the striped Stockholm rug (which I also like) but the Lappljung rug is $100 cheaper and offers a similar feeling to the Stockholm rug because it is also a white/black graphic. It has a tribal or bohemian feel, but it's not too boho. I personally have this rug in my bedroom, and I love it because it adds a lot of interest to an otherwise pretty ordinary bedroom. Ranarp Lamp - My eyes widen whenever I see anything that has gold or gold accents and the Ranarp lamp series is no exception. The picture to the left is the Ranarp floor lamp version, but the lamp also comes in a table lamp version as well. If you don't like white and gold, the Barometer is also a great alternative! 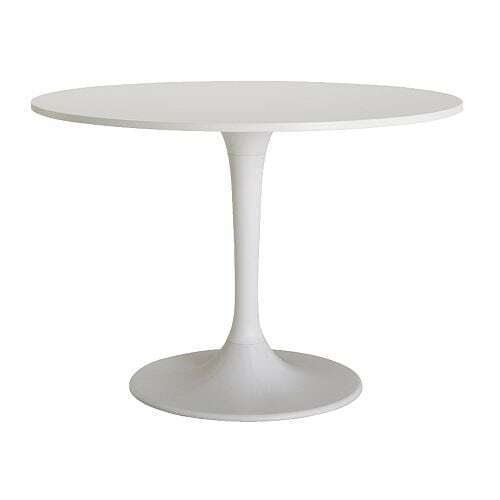 Docksta Table - The docksta table is clearly based off the beloved Tulip Table by Eero Saarinen. I hope to own a genuine Saarinen Tulip Table one day, but until and if that day ever comes, the Docksta is a great economically smart alternative. My favorite hack for this table? Replace the top with a Carrera marble slab and you instantly have a more amazing looking table! Frasera Whiskey Glass - I can't believe these beyond chic whiskey glasses are only $2.50 per glass. The diamond studded pattern on the glasses are pretty to look at, and feel even better when it's in your hand. I personally have these glasses on my home's bar cart. My friends have asked me where I've gotten these glasses and they're pleasantly surprised when I tell them Ikea! Don't imbibe? No problem, there is also a drinking glass version as well! Eivor Throw Blanket - I know you're beginning to see a theme here by this point - black and white. It definitely wasn't conscious on my part, but Ikea just does black & white very well in my opinion as evidenced by the Eivor throw blanket. A throw blanket is an easy and inexpensive way to add a little bit of interest, texture, and pattern to your space. If you have plain or solid sheets, drape this throw over the end of your bed to add some pattern to your bedroom! You can't go wrong with black & white stripes! Socker Greenhouse - Unless you buy vintage (and even with vintage pieces the glasshouse isn't as large), the Socker greenhouse from Ikea is the best value you're going to get at $20. You don't have to place greenery in this glasshouse. You use it display some collectibles, pretty costume jewelry, or whatever else you want displayed. Vittsjo Shelving Unit - I like these shelves a lot because they're extremely simple. I like the Vittsjo unit over the Billy bookcases because the Vittsjo takes up less visual space which is pretty crucial in small NYC apartments. Favorite hack for this item? Spray paint it gold and transform it into an etagere inspired by Milo Baughman. One thing that I had to mention, and it is in my opinion considered a favorite "item" from Ikea, are the Swedish meatballs!! Of course you have to eat the Swedish meatball dish at the Ikea cafeteria when you visit right?? Right?! Right.